Marne is a department in northeastern France named after the river Marne which flows through the department. The prefecture (capital) of Marne is Châlons-en-Champagne (formerly known as Châlons-sur-Marne). The Champagne vineyards producing the world-famous sparkling wine are located within Marne. Marne is one of the original 83 departments created during the French Revolution on 4 March 1790 with Châlons-sur-Marne as is capital. It was formed with part of the former province of Champagne. It was divided in six districts: Châlons-sur-Marne, Reims, Épernay, Sézanne, Sainte-Menehould and Vitry-le-François. In 1800, with the creation of the arrondissements in France, the six districts were changed into five arrondissements: Châlons-sur-Marne, Épernay, Reims, Sainte-Menehould and Vitry-le-François. On 10 September 1926, the arrondissement of Sainte-Menehould was eliminated but in 1940 Sainte-Menehould was made again an arrondissement. In 1995, the name of Châlons-sur-Marne was changed to Châlons-en-Champagne but it was rejected in 1997. But, finally, this change was accepted in 1998. Marne has an area of 8,161.6 km2 (3,151 sq mi), the 7th largest department of the Metropolitan France. The department is 116 km (72 mi) long from Villeneuve-la-Lionne to Trois-Fontaines-l'Abbaye, and 97 km (60 mi) wide from Cormicy to Clesles. The Champagne crayeuse in the centre of the department; it is a plain where cereals are grown. A region with low hills in the eastern part of the department. Champagne vineyards, in the western part of the deparment. Here is the Montagne de Reims ("Mountain of Reims") where are the highest points of the department in the forests of the Verzey commune; several hills are 286 m (938 ft) high (49°8′19″N 04°9′12″E﻿ / ﻿49.13861°N 4.15333°E﻿ / 49.13861; 4.15333﻿ (Foret Domaniale de Verzey)).. The Marne river flows through the department from the southeast to the west. This area is characterized by climates with few extremes of temperature. The Köppen climate classification type for the climate at Châlons-en-Champagne is a "Marine West Coast Climate" and of the subtype "Cfb". The average amount of precipitation for the year in Châlons-en-Champagne is 627.4 mm (24.7 in). The month with the most precipitation on average is July with 61 mm (2.4 in) of precipitation. The month with the least precipitation on average is February with an average of 40.6 mm (1.6 in). Marne is managed by the Departmental Council of Marne in Châlons-en-Champagne. 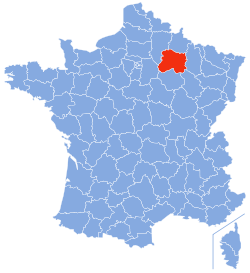 The department is part of the Grand Est region. There are 5 arrondissements (districts), 23 cantons and 616 communes (municipalities) in Marne. Marne had a population, in 2014, of 570,817, for a population density of 69.9 inhabitants/km2. The arrondissement of Reims, with 296,374 inhabitants, is the arrondissement with more inhabitants. The Porte Mars in Reims. ↑ "Président du Conseil départemental" (in French). La Marne rn ligne. Retrieved 3 December 2016. ↑ 2.0 2.1 2.2 2.3 "Département de la Marne (51)". Comparateur de territoire (in French). Institut national de la statistique et des études économiques - INSEE. Retrieved 3 December 2016. ↑ 3.0 3.1 3.2 "Historique de la Marne". Le SPLAF (in French). Retrieved 4 December 2016. ↑ "Foret Domaniale de Verzey, France". Peakbagger.com. Retrieved 5 December 2016. ↑ "Chalons-sur-Marne, France - Köppen Climate Classification". Weatherbase. Retrieved 5 December 2016. ↑ "Département de la Marne (51)". Géographie administrative et d'étude (in French). Institut national de la statistique et des études économiques - INSEE. Retrieved 12 July 2017. ↑ 7.0 7.1 7.2 "Département de la Marne (51) et Arrondissements". Comparateur de territoire (in French). Institut national de la statistique et des études économiques - INSEE. Retrieved 12 July 2017. ↑ "Décret n° 2014-208 du 21 février 2014 portant délimitation des cantons dans le département de la Marne" (in French). Légifrance.gouv.fr. Retrieved 5 December 2016. ↑ "Habitants du départment: Marne (51)" (in French). habitants.fr. Retrieved 5 December 2016. ↑ "Régions, départements, arrondissements, cantons et communes" (PDF). Populations légales 2014 (in French). Institut national de la statistique et des études économiques - INSEE. Retrieved 12 July 2017. Wikimedia Commons has media related to Marne (department). This page was last changed on 13 November 2017, at 00:19.